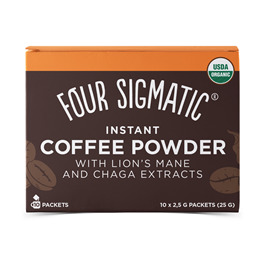 The Mushroom Coffee Mix with Lion`s Mane & Chaga contains half the caffeine, double the effects - without sacrificing the gourmet coffee flavour! 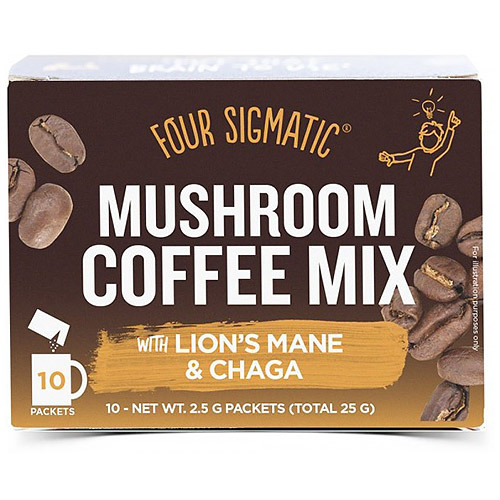 Four Sigmatic (formerly known as Four Sigma Foods) have combined fast-food convenience with superfood effectiveness to bring you the power of mushrooms in a revolutionary new way. Mushrooms are among the most studied superfoods in the world. You may not know that around 40 percent of Western medicines today, including penicillin, utilise mushrooms. Most people don`t consume these healthy types of mushrooms, so adding even small amounts could lead to significant health benefits. Choose from our selection of Four Sigmatic mushrooms to start reaping their rewards. Arabica instant coffee, lion`s mane mushroom dual extract (Hericium erinaceus), chaga mushroom dual extract (Inonotus obliquus), rhodiola root. Mix the contents of the packet into 200ml of hot water. Below are reviews of Mushroom Coffee Mix with Lion`s Mane & Chaga - 10 Packets by bodykind customers. If you have tried this product we'd love to hear what you think so please leave a review. If you are sleep deprived you need that coffee. After having my morning cup I feel energised, awake and sharp. I have bought boxes of these quite a few times and the main reason I was buying them was because it had Lion's mane in them which according to some is what is needed for regenerating nerves. I have nerve damage and was very interested. But as I say, I have bought a few boxes in the past and the Lion's mane has not had much of an effect. Aside from the Lion's mane, the taste is great but as much as I would like to carry on buying Lion's mane coffee, I can't keep forking out £11 plus the now £2 delivery. At first it seemed to have a "chemical" taste as I am used to freshly ground bio coffee. But now as a mid-morning drink it's very pleasant. Not sure how the health benefits are showing? A very enjoyable taste, cutting the less favorable effects of caffeine but maintaining the high antioxidant goodness.